Pies and football have a long history together. It brings together two things which we love in this country. You won't find this combination in Barcelona or Milan because frankly our climate is probably the main reason pies and football go hand in hand. What could be more British than a hot pie to keep warm during a cold winter football match? No one quiet knows when the first pie was eaten at a football match but there seems to be well over 100 years of history behind it and who are we to argue with tradition?! The chant of 'Who ate all the pies?' is often heard at British football matches and some attribute this to Sheffield United fans singing it at their own keeper William "Fatty" Foulke who is alledged to have weighed over 21 stone. The chant has also often been associated with 1980s and 1990s striker Micky Quinn, in part due to an incident in 1992 when a fan threw a pie onto the pitch. Micky promptly picked it up and ate it. In the 2008/09 season a guy called Tom Dickinson travelled the country in order to eat a pie at every football league ground, quite an achievement given that it meant 92 matches in one season! He wrote a book about his experiences which is aptly called '92 pies', which we have reviewed. The Pierateers might not have eaten all the pies quite yet but we have reviewed rather a lot, now topping over 600 hundreds pie reviews. Many of these have been eaten at a football match and below is our current league table which shows the best football pies we have eaten. 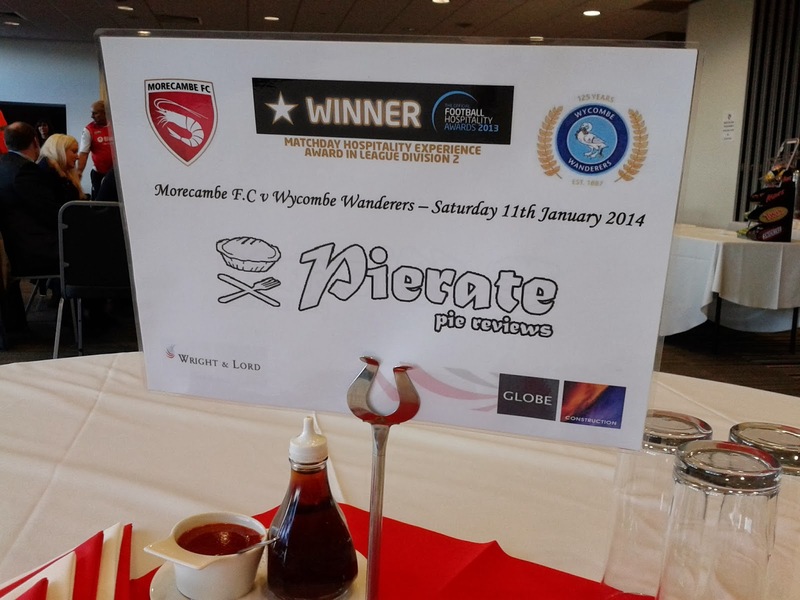 It is no surprise to find Morecambe FC currently top of the list with their homemade gourmet pies. This is relatively rare with most grounds selling mass produced brands such as Shire, Pukka or Peters. Many of these have also been reviewed by the Pierateers but this table focuses on only those eaten during the match.